Lately I have been thinking a lot about Middleman Pride. As a processor of meat, a driver-around of meat (must I be a distributor? ), and a marketer of meat, I am met with suspicion. What turns me on about being a middleman is that you have this spectacular view of the whole system and the ability to better every part of it, in some small way. 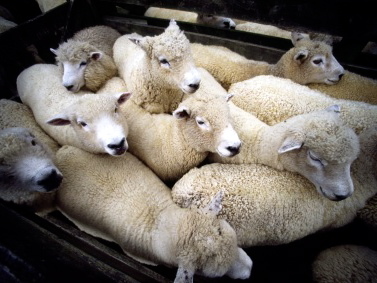 But other people — depending on the size of their pick-up truck and their comfort level with a cleaver — see middlemen as a necessary/unnecessary evil. This first led to Middleman Shame. I would sidle my job description up as close to the rancher as possible. I would share my volunteer work with Slow Food as a totem against disregard. I would sabotage my own profitability. But none of this worked. At this point, I may as well be a tax collector. The next phase was Middleman Rage. This had fast turnaround and anger increments of very low margins. I am now in a moment of Reconciliation. Love us or hate us, middlemen (or middlewomen, in my case) earn the majority of every food dollar spent in the U.S. We're everybody in between the farmer and the retailer: the slaughterer, the feedlot owner, the processor, the distributor. We expend a great deal of the energy that goes into every bite of food, and we have enormous power over the cost of your next meal. 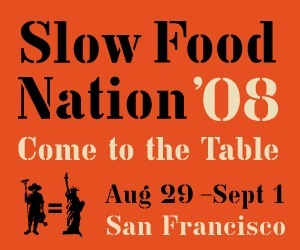 This Labor Day weekend, artisanal food producers from around the country — cheesemakers, ranchers, farmers, purveyors (including Sonoma Direct) and more — will be traveling to Slow Food Nation in San Francisco to celebrate authentic American foods. Throughout July and August, Culinate is proud to host some of these small-scale food producers as guest bloggers. But if consumers ignore this sector of the food business, it’s never going to change. The turn toward local begins to get at it, but it’s deeper than that. A rancher can go to every length to raise an animal with a low environmental impact, but the story can change once it leaves the ranch and gets into the food system. Here’s an example of a bad scenario: A rancher sends his 20 steers in a trailer to a slaughterhouse 250 miles away, because small local slaughterhouses are closing much quicker than they are being replaced in the U.S. His (or her) steers sit in a feedlot for six months before being slaughtered and butchered at the huge packing house that owns the feedlot. Their meat gets sent to three different states. And here’s an example of a good scenario: A rancher brings his (or her) pasture-raised steer to a local slaughterhouse when it is good and ready to be beef. The meat is processed at a butcher shop nearby and sold to local consumers. These examples are ridiculously simplistic, of course, but the basic storylines are very relevant. The storyline we choose to make reality affects our health and our economy as well as our respect for animals and the environment. If we supported Middlemen in making the right decisions, then we would have not just better food, but a better food system. Part of what I mean by “support” is the understanding that it costs more to do things small. And part of it is asking questions, pushing standards, and being engaged with the distributors and butchers. Because after all, we’re people, too.